Welcome to Monster Land. I guess everyone who has a Master System should know this Game as it is one of the best Games. Also this Game has nothing to do with the original Wonder Boy (except for the Title and the Character). 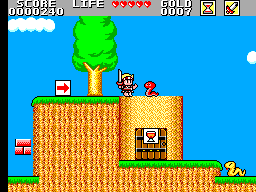 In the first game you ran around in a forest throwing hammers at snails and rocks, it was a ordinary Jump and Run. Monster Land is more an Action-Adventure with RPG-Elements; i would call it Action-RPG. The Background story fits this Type of Game well: Go out and find the Dragon who is hiding in a Labyrinth and kill him. As this is a side-scroller you just must get from the Left to the Right. As this would be a bit boring, there are a lot of different Enemies, who attack you, so kill them before they did it. Most of them leave Money, which you should collect, also you should jump on every tree cause as everyone knows money grows on trees (Wouldn't be that great in Reality?) You can spend the Money in Shops to improve your Character, you can buy everything Armour, Boots, Shields and even Magic like Thunder flash or Fireballs. There are also Taverns where you can buy beer or spend some Money at the Hospital to refill your Hearts. Also in every Level is a Person you must find, most of them are hidden behind Walls or Rooms. They are important and will help you finding the Dragon and beat him. One thing I don't like (and it's the only thing) is the Hourglass. When all of the Sand passes from the Top to the Bottom you lose a part of your Life Hearts. You can refill it, either you enter a Shop and buy something or you find a little Hourglass. But in the labyrinth you won't find one and it can be really difficult to survive. 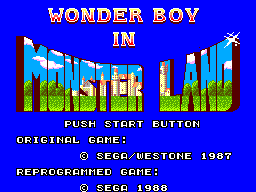 Wonder Boy in Monster Land is a pretty extensive Game which needs some Time to finish it. So it's a shame that this Game has no save option or Passwords. This is also a Problem as in the middle of the Game you arrive by the Sphinx. Answer his Question wrong and you can start again. Fantastic Graphics. Every thing is well designed; the Characters and Animals are nice and have some good Animations. The Levels are great and especially the Towns look awesome and realistic. And Monster Land is a Land as you walked around Towns, Forests, Caves Islands and swim in Lakes. Excellent Music here. Most of the songs here are fantastic and fit the Game. The Sound effects are great and the only thing i hate is the noise when your life meter is low. Button 1 is for the Sword Attack and Button 2 is to Jump and you activate the Magic by pressing down on the D-Pad. That's the only thing to blame here, it can happen that you press accidental down and release your Magic, it made it also impossible to climb down ladders and there are some Parts you can only leave over a ladder. You can play this Game over and over again. It's just Fun to run around in Monster Land and kill the Monsters, collect Money and buy new Items. 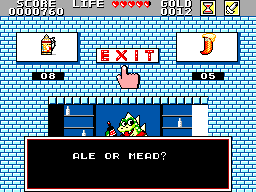 Wonder Boy in Monster Land is an awesome Game. Everything is great and the Master System Version is way better than the Arcade. Without the Hourglass and save game option this Game could be perfect. But it's great anyway and everyone who owns a Master System must have this Game.